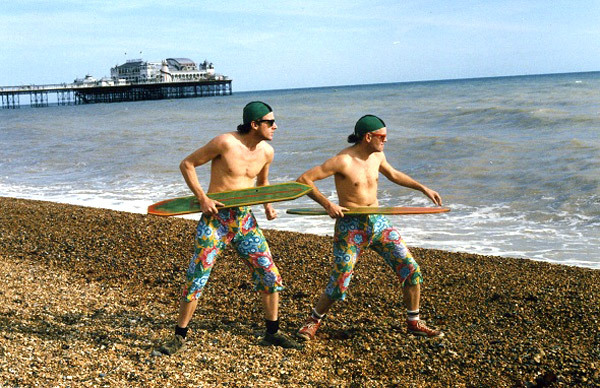 Its summer and everybody’s going surfing but we’ve got far too much to do. From the Wye Valley River Festival to Terschelling Island, from Glasto to Bristol, we’re pedalling upstream through the choppier economic waters. There’s no denying that arts companies face increased funding challenges at the moment but we believe that new links between heritage organisations, tourism and the arts have great potential to benefit all parties while promoting the UK’s history, culture and incredible landscapes. From this autumn we’ll be looking for partners to develop a new show about culture and conflict over the last 100 years, particularly museums. Get in touch if that floats your boat or if you have a project we could help with on office@desperatemen.com or 0117 939 3902. 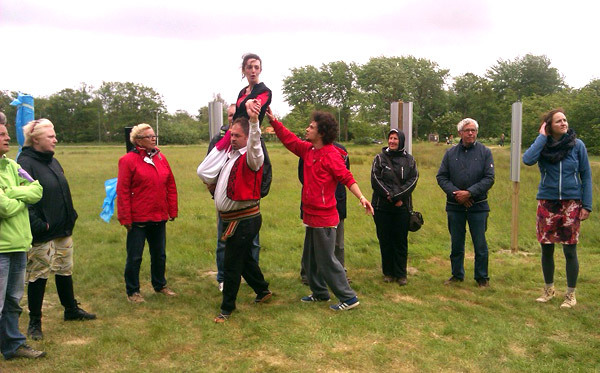 The inaugural May 2014 festival is shaping up to be a new leap forward in our work embedding outdoor art in the landscape and engaging the communities that inhabit it. On the artistic side, Arts Council Wales and the Wye Valley AONB are funding creative development meetings with artists including Articulture, Tin Shed, Artspace Cinderford, G-Dance, Citrus Arts, Kitcsh’n’Sync and Rural Media. We’re also forging links between the agencies involved, from the National Trust to local authorities and tourist boards. 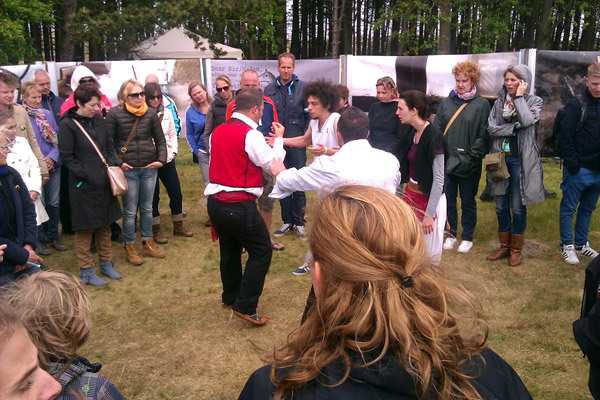 Teatri Oda’s Invisible Walls, co-directed by Jon Beedell for In Situ, debuted at Oerol Festival in June. This show about the social and political barriers that prevent movement and sometimes even communication, explores how freedom of choice comes at a cost. The Kosovan members of Teatri Oda have direct experience of all these themes and their performances on Terschelling moved audience members to tears. Read more here. 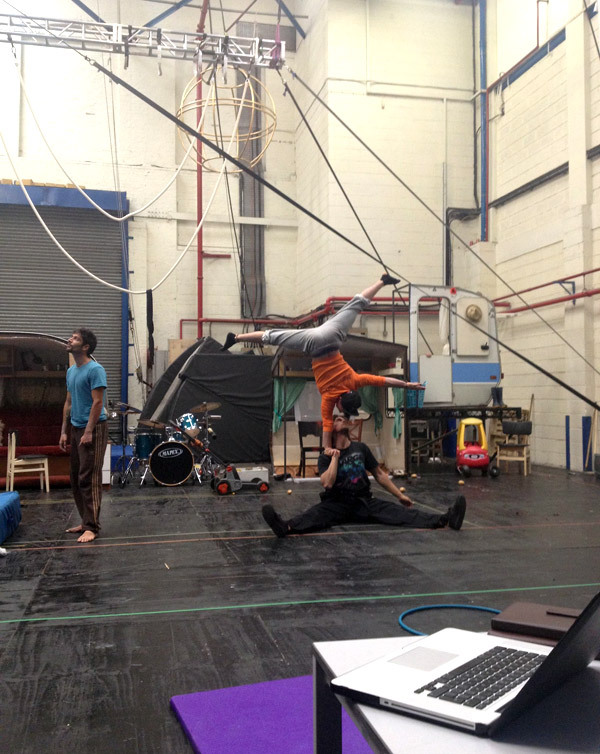 Richard Headon has been acting as dramaturg for Circus Space graduate show Happy Families which opens on July 3 at Jackson’s Lane, London. Set in a caravan park, the show is a clever twist on the card game with a warped easy listening soundtrack by Dom Coyote. Billy Alwen directs, Helen Parlor is choreographer. 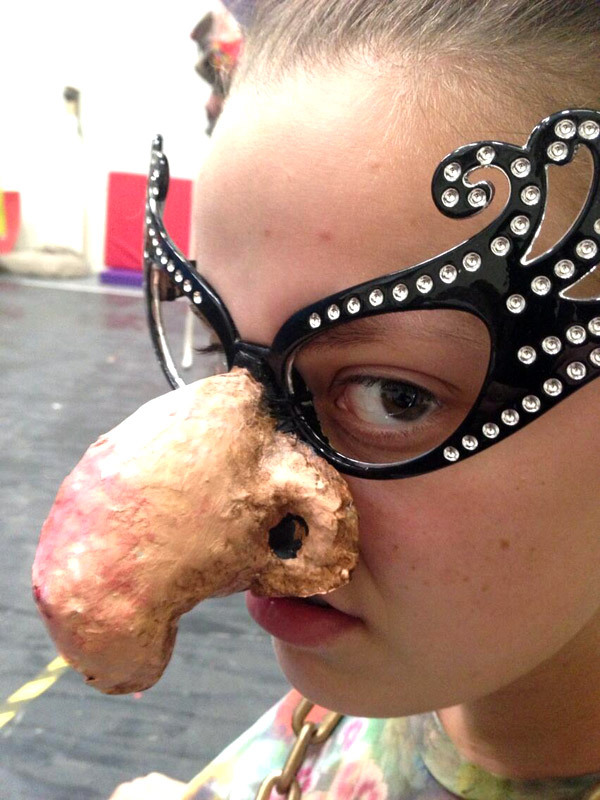 You can catch extracts from the show at Bristol Harbour Festival and Bestival too. The Maritime Mix report on last year’s Cultural Olympiad by the sea is now out – you can download a copy here. It has a summary of the economic and cultural benefits of the events, including Battle for the Winds, and some of the lessons learned from the programme delivery. Following last year’s Torch Wade, Jon has developed a taste for fire and on June 28 found himself leading Glastonbury’s annual Fire Procession. There are a few pictures here (scroll down to Theatre and Performance section) and more to come. The very next day we were back in Bristol hosting the launch of the Celebrating Age Festival! We also had a lot of fun hosting the Badocks Wood Party on June 9, with picnics and woodland rambles. July 7: We’ve put together a smorgasbord of Bristol’s best performers and street artists for one day only. 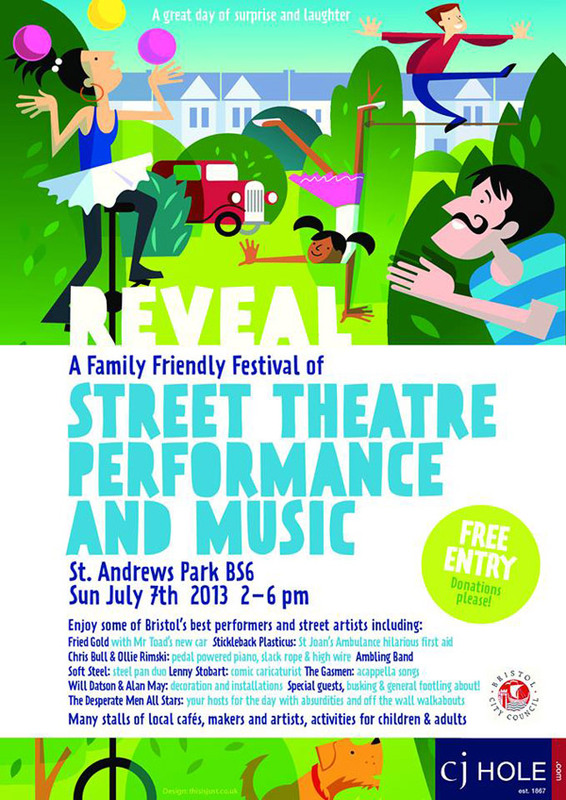 REVEAL in St Andrew’s Park starts at 2pm and features Stickleback Plasticus, Fried Gold, the Ambling Band, stalls, installations and much more. July 13: We’re workshopping with Wye Valley AONB Youth Rangers, helping them develop ways to deliver creative countryside walks and presentations. July 21: The Pirates are breaking out of their chest for a seadog’s holiday at the next Bristol “Make Sundays Special” event. Last month the Film Crew went walkabout and had a whale of a time in the traffic-free roads. July 27-28: It’s the Bristol Harbour Festival! Start practising your tossing now for the annual splashfest of silliness that is the Water Balloon Toss and keep an eye out for the Funnels too. It’s lovely in our studio at this time of year – give us a ring if you need a low-cost rehearsal, workshop or meeting space. Piano and plastic heron provided at no extra cost.